I present you this simple makeup set, which is perfect for the everyday wear and formal party. It includes lipstick and eyeshadow, you can download both of them separately. - Available for females, teen to elder. - Can be used in all clothing categories, maternity and career included. - 3 recolorable channels: inner eye corner, top eyelid, outer eye corner. The eyeshadow looks good in all colors, bright and dark, creating very soft "smokey" look. 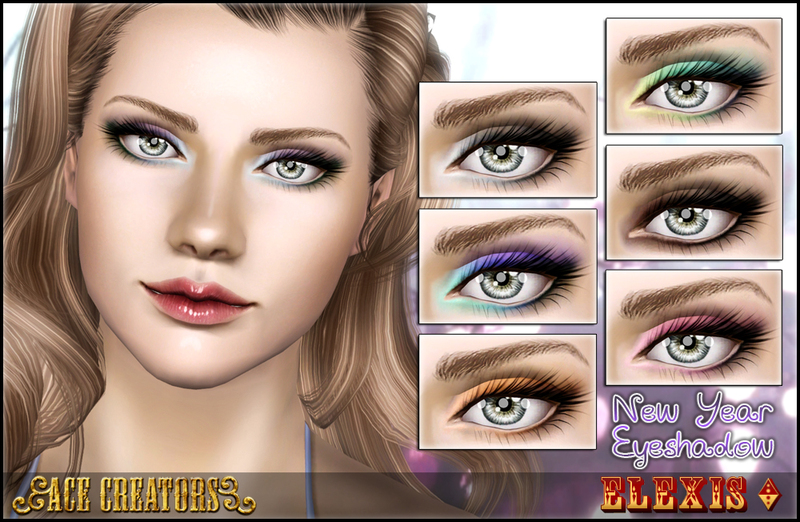 It creates an illusion that you Sim is wearing an eyeliner which helps to get the eyes look more defined. The textures are semi-transparent so it should always look realistic. 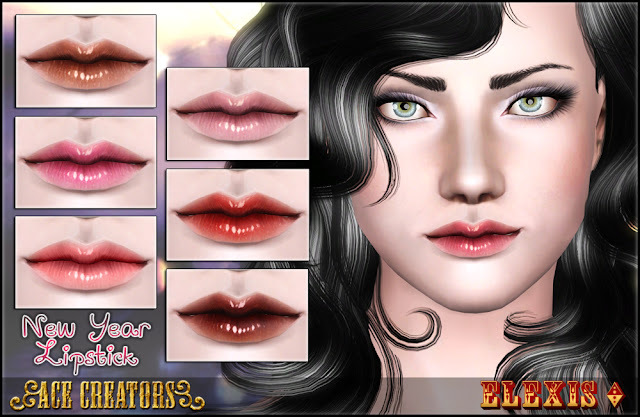 - 3 recolorable channels: base lip color, outline color, shine color. This lipstick looks best when the outline color is set very close to the skin color, the soft transition makes it look natural in all colors. The whole lipstick has a little bit of a sparking effect on it which is also adjustable with the second color channel. You can make it look completely matte if the shiny parts color is set the same as base lip color. If you want to use this in your uploads or post on your site, just link back here. Thanks Elexis! Luv your makeup! Also just wondering if you ever consider making the makeup texture 2048x2048? I notice some creators for example Gosik do this. Maybe the difference is too little to bother. Just thought I mention it since you use HQ mod. And your makeup look good enough as 1024x1024 already! Wow, amazing make up! Thank you! Have a great New Year! the lipstick is so beautiful (L) tyvm. That eyeshadow is absolutely STUNNING, great work, Elexis! Perfect!! I'll definitely show credits when I use this on my sims!